A Man Called Ove, (Swedish), (♦♦♦♦♦): Curmudgeon Ove oversees the gated property where he resides. He has recently quit his job of forty years and his only dream left is joining Sonja, his late wife, in the hereafter. Little does he know that he will have to perform small acts of kindness towards his new neighbors that will change his outlook on life. Not too long ago Dorothy @ The Nature of Things reviewed Fredrik Backman's novel A Man Called Ove, and I realized that I wanted to read it. This movie is a Swedish adaptation of the novel and Backman co-wrote the script. A Man Called Ove made me experience a gamut of emotions; I laughed hysterically in the first half of the movie, and by the end I cried so hard...It is one of those movies that make you think about one's approach to life. Curmudgeon Ove is a character that starts out angry with life and people in general, and by the end one realizes he has a heart of gold (hence the crying). Worth seeing! Inferno (♦♦♦♦): Harvard symbologist Robert Langdon wakes up disoriented on a hospital bed in Florence. In his mind flash images of the end of the world. When a woman posing as a Carabiniere attempts to shoot him in his hospital room, young doctor Sienna Brooks risks her life to help him escape. Now both Langdon and Sienna join forces to decipher the meaning of an item in his possession, connected to a radical billionaire and to Dante's masterpiece Inferno. As in the previous two adaptations of Dan Brown's works, Inferno is directed by Ron Howard and stars Tom Hanks as Robert Langdon. Felicity Jones stars as doctor Sienna Brooks. This movie has dynamic camera work that perfectly suits the action scenes. It is also filled with apocalyptic imagery, appropriate given the gloomy topic. As always, Langdon gets to show off his expertise in exotic locales and save the day, and both Tom Hanks and Felicity Jones are perfect in their roles. 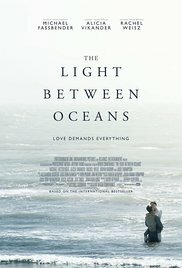 The Light Between Oceans (♦♦♦♦): Tom Sherbourne, a veteran of WWI, gets a temporary job as lighthouse keeper on Janus, a rocky outpost off the southwestern coast of Australia. As the job becomes permanent, Tom marries Isabel, a local young woman, and together they make a life on Janus. After two miscarriages, Isabel is devastated to know she won't be able to get pregnant ever again, but when a boat dragged by the currents arrive on the coast carrying aboard a dead man and a crying baby girl, Isabel sees this as a way to realize her dream of motherhood. Little do the Sherbournes know that that act of kindness and selfishness will have repercussions they can't foresee. This movie is the adaptation of M.L. Stedman's homonymous novel. It has Michael Fassbender, Alicia Vikander, and Rachel Weisz in the leading roles. I thought at first that Fassbender was an odd choice to interpret Tom Sherbourne because I imagined a younger man in that role, but Fassbender and both leading ladies nailed their performances. The movie conveys the isolation of Janus by displaying a rocky promontory, and the vastness and (at times) the fury of the sea surrounding it. The actors, with the help of a solid screenplay, convey the moral dilemma and the heartbreaking choices that have devastating consequences for everyone involved. I cried and empathized with the characters, and as a reader, I was satisfied that the movie followed the book very closely. 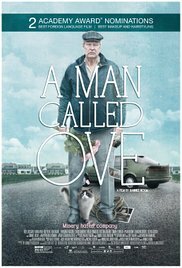 Your experience with the movie A Man Called Ove is the same as mine with the book; I laughed, I cried, I loved it. Ove is such a wonderful character. With all three of these movies, it sounds as if you had delightful viewing experiences. I did, they were wonderful movies, but I have been crying with movies over the last three or four days. One of my reading groups had read The Light Between Oceans so we went to the movie together when it was in the theaters. All agreed it was one of the best adaptations from a novel we had seen. Lots of tissues!! We will be reading A Man Called Ove soon, then the movie. Get ready to laugh and cry. Yes, I want to see Ove the movie. Maybe tonight. I see it got an Oscar nomination for Foreign Language film. I liked The Light Between the Oceans both as a novel & movie. It did follow the book closely. Well acted with great cinematography. I agree. I know, right? It was done well. The only one I've seen is Inferno. Like you, I enjoyed the camera work, visuals and acting performances. I thought it was right on track to be one of my favourite adaptations of 2016...but then they changed the ending! Such a shame. I will have to read it to find out about the ending. We saw "The Light Between Oceans". This film was a total disappointment. In our circle, nobody liked this movie. The adaptation is not success. What a pity, on the other hand, the book has enormously pleased around here. Too bad you didn't like the adaptation of The Light Between Oceans. I thought it was done well, but different people perceive a book or a movie differently and that's the beauty of it. I actually fancy the Swedish film (A Man Called Ove) Sounds like something I would enjoy. You'll most likely end up crying. I hope you love it as I did.